Edgar Brock was born on 28 May 1899. He married Jessie Susan Thomas, daughter of Henry A. Thomas and Anna Marie Mollet, after 1930. Edgar Brock died in March 1972 at age 72. Edgar Brock obtained US Social Security Card at Oregon; last residence Salem, Marion, Oregon. Name Variation McClellan Thomas was also known as Clell. McClellan Thomas was born on 27 July 1898 at Oregon. He was the son of Henry A. Thomas and Anna Marie Mollet. McClellan Thomas married Margaret Ann Ashenfelter, daughter of Jacob Ashenfelter and Edith (? ), on 14 May 1917 at Gilliam, Oregon. McClellan Thomas died in February 1987 at age 88. McClellan Thomas obtained US Social Security Card; last residence North Bonneville, Skamania, Washington. [S245] U.S. Federal Census 1900 U.S. Federal Census, by Ancestry.com, ED144. Dwelling 311. [S244] U.S. Federal Census 1910 U.S. Federal Census, by Ancestry.com, ED216. Dwelling 84. [S243] U.S. Federal Census 1920 U.S. Federal Census, by Ancestry.com, ED45. Dwelling 22. [S250] U.S. Federal Census 1930 U.S. Federal Census, by Ancestry.com, ED24-70. Dwelling 67. Married Name 14 May 1917 As of 14 May 1917,her married name was Thomas. Margaret Ann Ashenfelter was born on 13 February 1893 at Oregon. She was the daughter of Jacob Ashenfelter and Edith (?). Margaret Ann Ashenfelter married McClellan Thomas, son of Henry A. Thomas and Anna Marie Mollet, on 14 May 1917 at Gilliam, Oregon. [S272] Oregon Death Index, 1903-98 (published), Certificate: 84-22344. [S244] U.S. Federal Census 1910 U.S. Federal Census, by Ancestry.com, ED64. Dwelling 45. Clifford M. Thomas was born in April 1900 at Oregon. [S325] Oregon, Oregon Marriages, 1906-20. [S243] U.S. Federal Census 1920 U.S. Federal Census, by Ancestry.com, ED323. Dwelling 84. [S250] U.S. Federal Census 1930 U.S. Federal Census, by Ancestry.com, ED24-72. Dwelling 225. Name Variation Lorene N. DeGuire was also known as Loreen. Married Name 1 May 1920 As of 1 May 1920,her married name was Thomas. Lorene N. DeGuire was born circa 1901 at California. She was the daughter of Henry R. DeGuire and Jennie (?). [S244] U.S. Federal Census 1910 U.S. Federal Census, by Ancestry.com, ED230. Dwelling 298. [S243] U.S. Federal Census 1920 U.S. Federal Census, by Ancestry.com, ED476. Dwelling 50. Name Variation Charles Thomas was also known as Charlie. Charles Thomas was born on 14 January 1902 at Oregon. Charles Thomas married Lavena Peggy Rogers circa 1924. Charles Thomas died in October 1966 at age 64. He was buried in October 1966 at City View Cemetery, Salem, Marion, Oregon. [S250] U.S. Federal Census 1930 U.S. Federal Census, by Ancestry.com, ED26-218. Dwelling 59. Name Variation Lavena Peggy Rogers was also known as Mary Lavena. Married Name circa 1924 As of circa 1924,her married name was Thomas. Lavena Peggy Rogers was born on 16 January 1905 at Oregon. 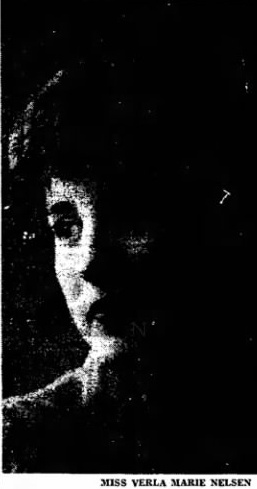 She married Charles Thomas, son of Henry A. Thomas and Anna Marie Mollet, circa 1924. Lavena Peggy Rogers died on 13 February 1990 at Washington, Oregon, at age 85. She was buried after 13 February 1990 at City View Cemetery, Salem, Marion, Oregon. Archie R. Thomas married Thelma (?). Archie R. Thomas died on 5 February 1987 at Lincoln, Oregon, at age 83. He was buried after 5 February 1987 at Pacific View Memorial Gardens, Lincoln, Lincoln, Oregon. Archie R. Thomas obtained US Social Security Card at Oregon; last residence Lincoln City, Lincoln, Oregon. [S9] South Dakota, South Dakota Birth Records South Dakota, State File Number: 528537 (unknown file date). [S243] U.S. Federal Census 1920 U.S. Federal Census, by Ancestry.com, ED212. Dwelling 138. Stamp 153. [S250] U.S. Federal Census 1930 U.S. Federal Census, by Ancestry.com, ED24-55. Dwelling 397. Harvey Allen Thomas was born circa 1907 at Oregon. Harvey Allen Thomas married Virginia Neef, daughter of John Harold Neef and Grace (? ), circa 1927. [S250] U.S. Federal Census 1930 U.S. Federal Census, by Ancestry.com, ED24-63. Dwelling 223. Married Name circa 1927 As of circa 1927,her married name was Thomas. Virginia Neef was born circa 1910 at Minnesota. Virginia Neef married Harvey Allen Thomas, son of Henry A. Thomas and Anna Marie Mollet, circa 1927. Elvin Evans Thomas was born on 15 May 1910 at Oregon. Elvin Evans Thomas married Vera Sophia Alderin, daughter of George N. Alderin and Edith Roberts, in 1933. Elvin Evans Thomas died on 5 June 1991 at age 81. He was buried after 5 June 1991 at Willamette National Cemetery, Portland, Multnomah, Oregon. Elvin Evans Thomas obtained US Social Security Card at Oregon; last residence not specified. Name Variation Vera Sophia Alderin was also known as Vera J. Married Name 1933 As of 1933,her married name was Thomas. 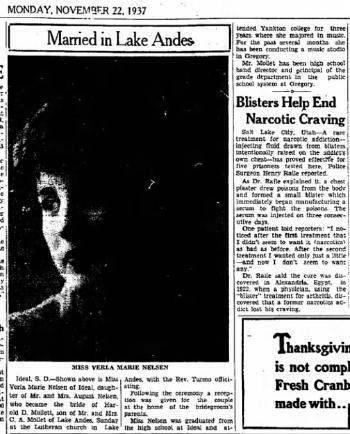 Vera Sophia Alderin was born on 31 October 1913 at Oregon also reported as 25 Sep 1914. She was the daughter of George N. Alderin and Edith Roberts. Vera Sophia Alderin married Elvin Evans Thomas, son of Henry A. Thomas and Anna Marie Mollet, in 1933. Vera Sophia Alderin died on 28 January 2004 at Washington at age 90. Vera Sophia Alderin was living in December 2003; living in a care center. [S243] U.S. Federal Census 1920 U.S. Federal Census, by Ancestry.com, ED350. Dwelling 5. [S250] U.S. Federal Census 1930 U.S. Federal Census, by Ancestry.com, ED24-69. Dwelling 131. Name Variation Carrie Christine Mollet was also known as Katie C.
Married Name circa 1896 As of circa 1896,her married name was Rands. Married Name 19 March 1913 As of 19 March 1913,her married name was Schulthess. She was the daughter of John J. Mollet and Caroline L. Peter. Carrie Christine Mollet married Richard Rands, son of William Rands and Anna Sparling, circa 1896. Carrie Christine Mollet married George G. Schulthess on 19 March 1913 at Benton, Oregon, listed as "Rands, Carrie & Schulthess, Gottlieb." Carrie Christine Mollet had 4 with 4 living in 1910 children. [S9] South Dakota, South Dakota Birth Records South Dakota, State File Number: 614262 (unknown file date). [S272] Oregon Death Index, 1903-98 (published), certificate 545. [S246] U.S. Federal Census 1880 U.S. Federal Census, by Ancestry.com, Stamp 456B. Dwelling 241. [S245] U.S. Federal Census 1900 U.S. Federal Census, by Ancestry.com, ED187. Dwelling 162. [S244] U.S. Federal Census 1910 U.S. Federal Census, by Ancestry.com, ED216. Dwelling 107. [S243] U.S. Federal Census 1920 U.S. Federal Census, by Ancestry.com, ED5. Dwelling 186. [S250] U.S. Federal Census 1930 U.S. Federal Census, by Ancestry.com, ED24-78. Dwelling 28. [S373] U.S. Federal Census 1940 U.S. Federal Census, by Ancestry.com, Year: 1940; Census Place: Salem, Marion, Oregon; Roll: T627_3375; Page: 6A; Enumeration District: 24-71. Richard Rands was born on 22 February 1865 at Canada also reported as 22 Feb 1863. He was the son of William Rands and Anna Sparling. Richard Rands married Carrie Christine Mollet, daughter of John J. Mollet and Caroline L. Peter, circa 1896. Richard Rands died on 19 October 1910 at Salem, Marion, Oregon, at age 45. 1871 Morris, Huron North, Ontario, Canada Richard Rands appeared on the census of 1871 in the household of William Rands at Morris, Huron North, Ontario, Canada. 1885 Hutchinson, South Dakota Richard Rands appeared on the census of 1885 at Hutchinson, South Dakota. William Rands witnessed the migration in April 1881 at Canada to, South Dakota; through port of Detroit, Michigan. [S304] Oregon, Union Hill Cemetery, Marion County, Oregon, Front Row, 3rd Lot left of little gate. Name Variation Harry Allen Rands was also known as Henry. He was the son of Richard Rands and Carrie Christine Mollet. Harry Allen Rands married Esma E. Griswold on 21 December 1929 at Portland, Multnomah, Oregon. Harry Allen Rands died on 4 February 1989 at age 91. He was buried after 4 February 1989 at Crescent Grove Cemetery, Tigard, Washington, Oregon. Harry Allen Rands obtained US Social Security Card at Oregon; last residence Portland, Washington, Oregon. He attended school in 1913 at Corvallis High School, Corvallis, Oregon. [S9] South Dakota, South Dakota Birth Records South Dakota, State File Number: 579229 (unknown file date). [S250] U.S. Federal Census 1930 U.S. Federal Census, by Ancestry.com, ED26-133. Dwelling 87. [S373] U.S. Federal Census 1940 U.S. Federal Census, by Ancestry.com, Year: 1940; Census Place: Portland, Multnomah, Oregon; Roll: T627_3392; Page: 8A; Enumeration District: 37-434. Married Name 21 December 1929 As of 21 December 1929,her married name was Rands. Esma E. Griswold was born on 12 July 1903 at Washington. She married Harry Allen Rands, son of Richard Rands and Carrie Christine Mollet, on 21 December 1929 at Portland, Multnomah, Oregon. Esma E. Griswold died on 16 May 1983 at Clackamas, Oregon, at age 79. She was buried after 16 May 1983 at Crescent Grove Cemetery, Tigard, Washington, Oregon. Esma E. Griswold obtained US Social Security Card at Oregon; last residence Portland, Washington, Oregon. William John Rands married Esther M. Carothers on 21 September 1934 at Vancouver, Clark, Washington, also reported as Corvallis, Benton, OR. William John Rands died in November 1986 at age 87. William John Rands obtained US Social Security Card at Oregon; last residence Westfir, Lane, Oregon. [S9] South Dakota, South Dakota Birth Records South Dakota, State File Number: 579228 (unknown file date). Married Name 21 September 1934 As of 21 September 1934,her married name was Rands. Esther M. Carothers was born on 6 June 1915. She married William John Rands, son of Richard Rands and Carrie Christine Mollet, on 21 September 1934 at Vancouver, Clark, Washington, also reported as Corvallis, Benton, OR. Esther M. Carothers died in March 1982 at age 66. Esther M. Carothers obtained US Social Security Card at Oregon; last residence Westfir, Lane, Oregon. Clarence Ray Rands married Hopewell R. Whittemore, daughter of (?) Whittemore and Mary A. (? ), on 17 September 1921 at Benton, Oregon. Clarence Ray Rands died on 12 April 1995 at age 93. 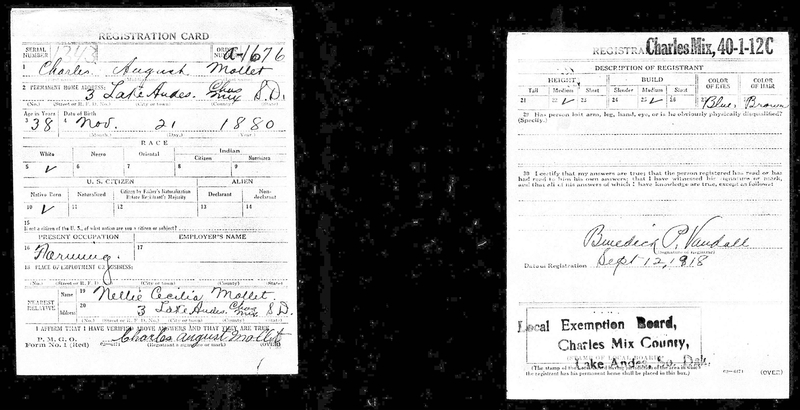 Clarence Ray Rands obtained US Social Security Card at Alaska; last residence Sitka, Sitka, Alaska. [S9] South Dakota, South Dakota Birth Records South Dakota, State File Number: 579227 (unknown file date). [S250] U.S. Federal Census 1930 U.S. Federal Census, by Ancestry.com, ED2-18. Dwelling 83. Married Name 17 September 1921 As of 17 September 1921,her married name was Rands. Hopewell R. Whittemore was born on 6 June 1901 at Minnesota. She was the daughter of (?) Whittemore and Mary A. (?). Hopewell R. Whittemore married Clarence Ray Rands, son of Richard Rands and Carrie Christine Mollet, on 17 September 1921 at Benton, Oregon. Hopewell R. Whittemore died in 1998 at Sitka, Alaska. Married Name Her married name was Cole. Married Name 19 September 1924 As of 19 September 1924,her married name was Anderton. Mabel Joy Rands married (?) Cole. Mabel Joy Rands was born circa 1906 at South Dakota. She was the daughter of Richard Rands and Carrie Christine Mollet. 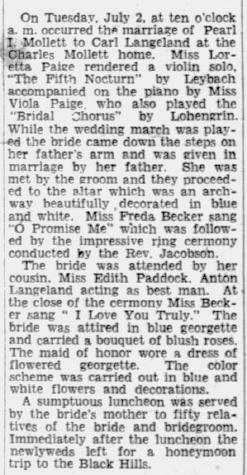 Mabel Joy Rands married George Henry Anderton on 19 September 1924 at Marion, Oregon. Mabel Joy Rands died in 1936. Mabel Joy Rands was a housekeeper in private home in 1930. [S250] U.S. Federal Census 1930 U.S. Federal Census, by Ancestry.com, Year: 1930; Census Place: South Corvallis, Benton, Oregon; Roll 1939; Page: 3B; Enumeration District: 30; Image: 905.0. Name Variation George G. Schulthess was also known as Gottlieb. George G. Schulthess was born on 15 October 1876 at Switzerland. He married Carrie Christine Mollet, daughter of John J. Mollet and Caroline L. Peter, on 19 March 1913 at Benton, Oregon, listed as "Rands, Carrie & Schulthess, Gottlieb." George G. Schulthess obtained US Social Security Card at Oregon; last residence Salem, Marion, Oregon. He immigrated in 1900. [S272] Oregon Death Index, 1903-98 (published), certificate 18496. Name Variation Charles August Mollet was also known as C. A. Name Variation Charles August Mollet was also known as Mollett. Name Variation Charles August Mollet was also known as Chas. Nickname Charles August Mollet also went by the name of Charlie. He was the son of John J. Mollet and Caroline L. Peter. Charles August Mollet married Nellie Cecelia Carlson, daughter of Anders Gustav Carlsson and Johanna Gustafsdotter, on 19 April 1905 at Geddes, Charles Mix, South Dakota. He was buried after 29 March 1956 at Restlawn Memory Gardens, West Salem, Polk, Oregon. 1905 South Dakota Charles August Mollet appeared on the census of 1905 at South Dakota. 1915 South Dakota He appeared on the census of 1915 at South Dakota religion: Lutheran. 1925 South Dakota He appeared on the census of 1925 at South Dakota. 1935 White Swan, Charles Mix, South Dakota He appeared on the census of 1935 at White Swan, Charles Mix, South Dakota. On 12 September 1918 at WWI Civilian Draft Registration, Charles Mix, South Dakota. [S9] South Dakota, South Dakota Birth Records South Dakota, State File Number: 614263 (unknown file date). [S272] Oregon Death Index, 1903-98 (published), certificate 3183. [S245] U.S. Federal Census 1900 U.S. Federal Census, by Ancestry.com, Sheet 1B. ED83. Dwelling 20. [S243] U.S. Federal Census 1920 U.S. Federal Census, by Ancestry.com, ED 53. Sheet 1B. Dwelling 14. [S250] U.S. Federal Census 1930 U.S. Federal Census, by Ancestry.com, ED12-31. Dwelling 156. [S373] U.S. Federal Census 1940 U.S. Federal Census, by Ancestry.com, Year: 1940; Census Place: Milaca, Mille Lacs, Minnesota; Roll: T627_1938; Page: 5B; Enumeration District: 48-14A. Name Variation Nellie Cecelia Carlson was also known as Karlson. Married Name 19 April 1905 As of 19 April 1905,her married name was Mollet. Nellie Cecelia Carlson was born on 16 February 1885 at Charles Mix, South Dakota. She was the daughter of Anders Gustav Carlsson and Johanna Gustafsdotter. Nellie Cecelia Carlson married Charles August Mollet, son of John J. Mollet and Caroline L. Peter, on 19 April 1905 at Geddes, Charles Mix, South Dakota. She was buried after 4 November 1971 at Restlawn Memory Gardens, West Salem, Polk, Oregon. 1 June 1885 Charles Mix, South Dakota Nellie Cecelia Carlson appeared on the census of 1 June 1885 in the household of Anders Gustav Carlsson at Charles Mix, South Dakota; surname listed as Karlson. 1895 Forbes Town, Charles Mix, South Dakota Nellie Cecelia Carlson appeared on the census of 1895 in the household of Anders Gustav Carlsson at Forbes Town, Charles Mix, South Dakota. 1905 South Dakota Nellie Cecelia Carlson appeared on the census of 1905 in the household of Charles August Mollet at South Dakota. 1915 South Dakota Nellie Cecelia Carlson appeared on the census of 1915 in the household of Charles August Mollet at South Dakota; religion: Lutheran. 1925 South Dakota Nellie Cecelia Carlson appeared on the census of 1925 in the household of Charles August Mollet at South Dakota. 1935 White Swan, Charles Mix, South Dakota Nellie Cecelia Carlson appeared on the census of 1935 in the household of Charles August Mollet at White Swan, Charles Mix, South Dakota. Nellie Cecelia Carlson obtained US Social Security Card at Oregon; last residence Salem, Marion, Oregon. [S272] Oregon Death Index, 1903-98 (published), Certificate: 71-17378. [S245] U.S. Federal Census 1900 U.S. Federal Census, by Ancestry.com, ED80. Dwelling 150. He was the son of Charles August Mollet and Nellie Cecelia Carlson. Walter Charles Mollet died on 22 July 1972 at Yakima, Washington, at age 66. 1915 South Dakota Walter Charles Mollet appeared on the census of 1915 in the household of Charles August Mollet at South Dakota; religion: Lutheran. 1925 South Dakota Walter Charles Mollet appeared on the census of 1925 in the household of Charles August Mollet at South Dakota. Walter Charles Mollet obtained US Social Security Card at Washington; last residence Selah, Yakima, Washington. [S9] South Dakota, South Dakota Birth Records South Dakota, State File Number: 5454 (unknown file date). [S250] U.S. Federal Census 1930 U.S. Federal Census, by Ancestry.com, ED12-31. Dwelling 157. Name Variation Winifred Louise Young was also known as Winneford. Married Name 10 September 1929 As of 10 September 1929,her married name was Mollet. Winifred Louise Young was born on 19 March 1908 at Lake Andes, Charles Mix, South Dakota. She was the daughter of Burton John Young and Alice Stoen. Winifred Louise Young died on 22 May 1990 at Yakima, Washington, at age 82. Winifred Louise Young obtained US Social Security Card at Washington; last residence not specified. [S244] U.S. Federal Census 1910 U.S. Federal Census, by Ancestry.com, ED96. Dwelling 148. [S243] U.S. Federal Census 1920 U.S. Federal Census, by Ancestry.com, ED47. Dwelling 47. Name Variation Pearl Ida Mollet was also known as Pearl D.
Name Variation Pearl Ida Mollet was also known as Mollett. Married Name 2 July 1929 As of 2 July 1929,her married name was Langeland. Pearl Ida Mollet was born on 4 July 1907 at Corvallis, Benton, Oregon. She was the daughter of Charles August Mollet and Nellie Cecelia Carlson. Pearl Ida Mollet died on 27 September 2008 at Marion, Oregon, at age 101 Pearl Ida Langeland July 4, 1907 - September 27, 2008 SALEM - She was born July 4, 1907 in Corvallis, Oregon while her parents, Charles and Nellie Mollet were on vacation. She grew up and attended school in Lake Andes, South Dakota and graduated from Southern State Normal College in Springfield, South Dakota. She rode horseback to the one room schools where she taught. 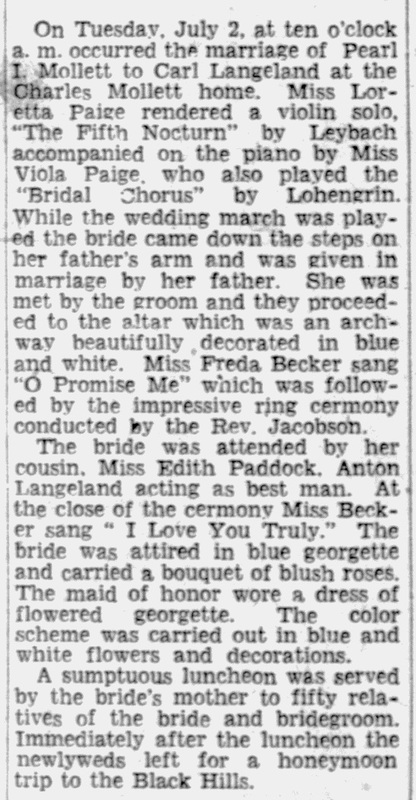 In 1929, she married Carl T. Langeland and they lived on a farm where their three children were born. In 1943, they moved to Salem, Oregon. She attended Western Oregon College of Education where she received her B.A. Degree. In the summers, she was a Bean Platoon Leader in the West Stayton area. She taught at Mission Bottom School, Keizer, and Cummings Elementary and in Woodburn before her retirement in 1972. She was a member of St. Mark Lutheran Church in Salem for many years and later joined Faith Lutheran Church near her home in Keizer. She taught Sunday School and Bible School, was a member of Faith Seniors and Women's Bible Study Group. She served as a reading volunteer at the current Keizer Elementary School; was a member of the Westmoreland Garden Club, and the Sons of Norway Thor Lodge where she received a 30 year membership pin. She was one of the principal organizers of the Senior Meals Program at Faith Lutheran Church. One of her greatest joys was serving on the Keizer School Heritage Board and seeing the completion of the historic renovation project. She enjoyed a cruise to Alaska, three trips to Norway, A National Christian Educators Conference at Wagner College in New York, and a Lutheranland Tour. She moved to Willamette Lutheran Retirement Community in 1995 and in 1997, was granted the Volunteer of the Year Award. Pearl was an excellent writer of short stories and several were included at the Annual Senior Short Story Writers events held at the University of Oregon. When she needed Assisted Living, she moved to Regency Woodland near her family in South Salem. Pearl loved her family and enjoyed reunions and gatherings, especially her birthday parties on the 4th of July. Pearl is survived by her sons, Rev. Melvin C. Langeland (Shirley) of Pomona, California and Rev. Marvin L. Langeland (Amy) of Salem; daughter, Lorraine Hickman of Salem; nine grandchildren; ten great-grandchildren; and five great-great-grandchildren; sister-in-law, Ruth Mollet; and numerous nieces and nephews. She was preceded in death by her husband, Carl T. Langeland; son-in-law, Edward Grace; granddaughter, Kathryn Aronson; and brothers, Walter, Harold, and Glen Mollet. Pearl will be greatly missed by her family and friends. She will always be remembered for her cheerful smile. A viewing will be from 1 to 5 p.m. on Friday, October 3 at Keizer Funeral Chapel. There will be a Commital Service at 12 p.m. on Saturday, October 4 at Restlawn Memory Gardens, 201 Oak Grove Rd. NW., Salem followed by a Memorial Service of Celebration at 2 p.m. at Faith Lutheran Church, 4505 River Rd. N., Keizer. Memorial contributions may be made to Faith Lutheran Church in Keizer or the Keizer Heritage Foundation. The family wishes to thank the wonderful staff persons of Regency Woodland and Willamette Valley Hospice for their loving care. Arrangements by Keizer Funeral Chapel. 1915 South Dakota Pearl Ida Mollet appeared on the census of 1915 in the household of Charles August Mollet at South Dakota; religion: Lutheran. 1925 South Dakota Pearl Ida Mollet appeared on the census of 1925 in the household of Charles August Mollet at South Dakota. Pearl Ida Mollet lived in July 2003 at Lutheran Senior Home, near Salem, Marion, Oregon. [S250] U.S. Federal Census 1930 U.S. Federal Census, by Ancestry.com, ED12-31. Dwelling 124. Name Variation Carl Talman Langeland was also known as Langland. He was the son of Lars K. Langeland and Kari Knutsdatter Aarhus. Carl Talman Langeland obtained US Social Security Card at Minnesota; last residence Salem, Marion, Oregon. [S9] South Dakota, South Dakota Birth Records South Dakota, State File Number: 640426 (unknown file date). [S272] Oregon Death Index, 1903-98 (published), Certificate: 78-16581. [S244] U.S. Federal Census 1910 U.S. Federal Census, by Ancestry.com, ED101. Dwelling 185. [S243] U.S. Federal Census 1920 U.S. Federal Census, by Ancestry.com, ED53. Dwelling 60. 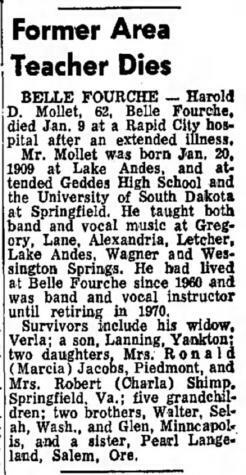 Harold D. Mollet was born on 20 January 1909 at Lake Andes, Charles Mix, South Dakota. Harold D. Mollet died on 9 January 1972 at Belle Fouche, South Dakota, at age 62. 1915 South Dakota Harold D. Mollet appeared on the census of 1915 in the household of Charles August Mollet at South Dakota; religion: Lutheran. 1925 South Dakota Harold D. Mollet appeared on the census of 1925 in the household of Charles August Mollet at South Dakota. Harold D. Mollet obtained US Social Security Card at South Dakota; Last residence Belle Fourche, Butte, South Dakota. Name Variation Verla Marie Nelsen was also known as Nelson. Married Name 21 November 1937 As of 21 November 1937,her married name was Mollet. Verla Marie Nelsen was born on 18 February 1916 at Saunders, Nebraska. She was the daughter of August Nelsen and Emma (?). Verla Marie Nelsen died before September 2008. On 8 January 1962 at Mr and Mrs August Nelson 50th wedding anniversary. [S243] U.S. Federal Census 1920 U.S. Federal Census, by Ancestry.com, ED205. Dwelling 163. [S250] U.S. Federal Census 1930 U.S. Federal Census, by Ancestry.com, ED14. Dwelling 50.